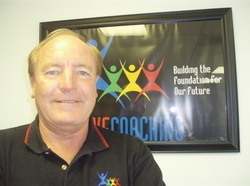 Welcome to Positive Sport Coaching! The mission of PSC, a non-profit organization, is to educate and encourage positive attitudes and behavior in all athletic endeavors by coaches, parents, administrators, media, and players. If you have any questions or comments we would love to hear from you. Visit our "Contact Us" page. And THANK YOU for supporting Positive Sport Coaching! "Autistic Basketball Manager shoots 6 three pointers and 1 two point shot in the last 4 minutes of the game." An uplifting video that demonstrates the importance of being a Positive Sport Coach. emotional strengths. He knew everything tied together to create the ultimate player and team -- studying hard required good mental control, which helped avoid mistakes on and off the court. as when he first developed it: Be true to yourself, make each day your masterpiece, help others, drink deeply from good books, make friendship a fine art, build a shelter against a rainy day, and give thanks for your blessings every day. as well as Super Bowl coaches George Siefert, Mike Holmgren and Sam Wyche. He said no aspect of coaching is more important than teaching. The best teachers, he advised, used direct, clear and concise language to make sure explanations were understood by everyone. Torre's first rule for success is understanding each and every one of his players; he knows their skills, their potential and their personalities-on and off the field. Torre claims this awareness is the only way to blend distinct personalities into a cohesive unit. Pat Summitt has won eight national championships at Tennessee and more than 1,000 games and counting. There are dozens of former and current players who tell stories about how much Summitt meant to their lives. The players speak about the lessons she taught them and the things she made them learn about themselves. Summitt once said of coaching , "Handle Success Like You Handle Failure. You can't always control what happens, but you can control how you handle it." See how one Coach and the support of the community can really make a difference in someone's life.